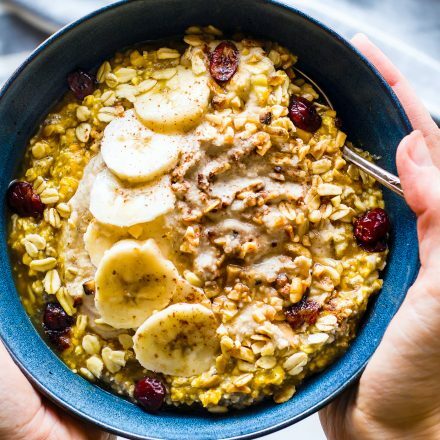 This vegan pumpkin overnight oats recipe is perfect for an easy fall breakfast. Pumpkin Overnight Oats with Cinnamon Cashew Cream and cranberry nut topping! Gluten free, healthy, easy, and oh so nourishing! Bring on the pumpkin, ya’ll! 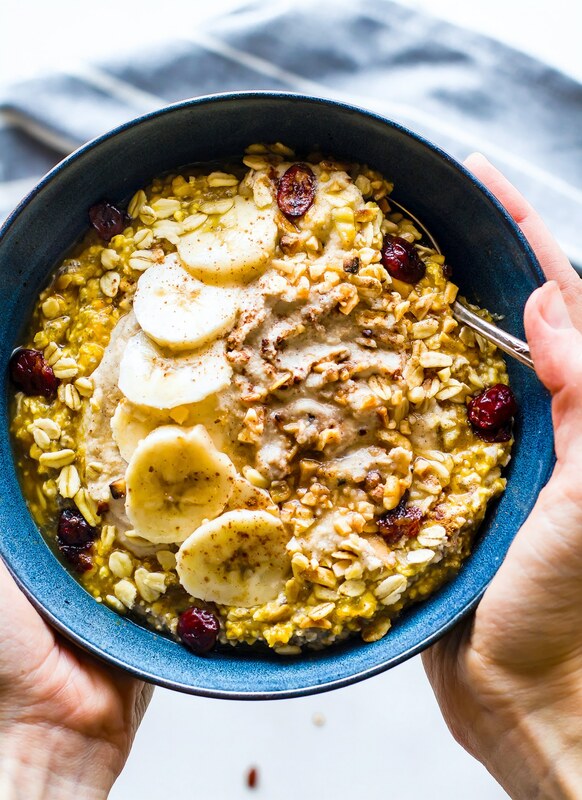 Pumpkin overnight oats are like the equivalent of the Summer smoothie bowl obsession but in Fall form. You know I’m right, right? But let’s back up a bit. Let’s talk about this week. Oh man, I’ve never been so excited. And again, excited for the little things. We’re traveling to a place with the cooler weather to expand our careers. It’s the first week of fall. And I finally get some quality time with my husband. That is after I attend my workshop. I don’t know what it is about fall, but to me, it feels like a renewal. The transition in seasons and a change in the air and colors around us. Never in my life have I liked change so much; change that brings good. 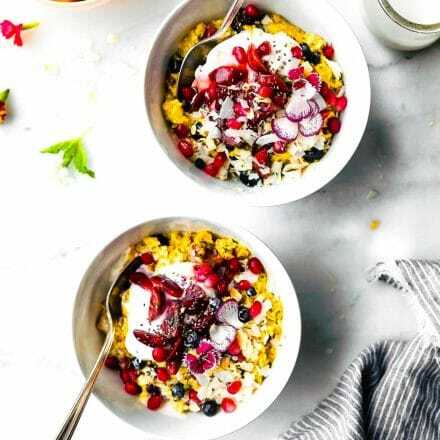 Change that brings creativity, nourishment, warmth, and in this case some mighty fine cranberry pumpkin vegan overnight oats with cinnamon cashew cream. I may have snuck in some pumpkin spice too. On top of the cranberry. That just fits, ya know? But really, changes are in the air for a reason. Our bodies crave more than just salads, smoothies, and cold sandwiches. Our bodies need extra “cuddling”, per se. Cold weather brings on carb cravings. Don’t believe me? You should really read my other pumpkin bread post about how we need carbs during the fall. It’s really true! We crave more warm and carb rich food because our circadian rhythm is adapting to the change in environment. Less sunlight means we need more Vitamin D. Vitamin D controls Serotonin production (source). Serotonin is the “feel good” neurotransmitter. 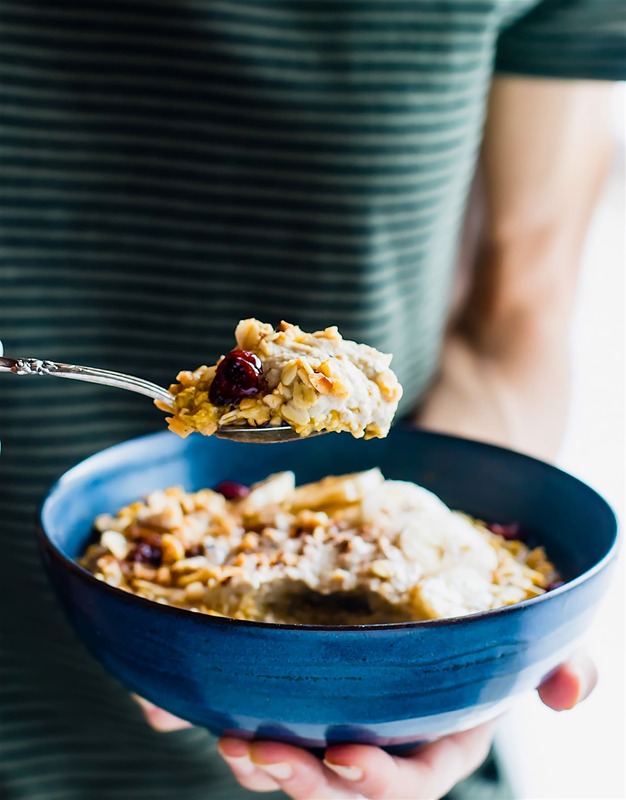 Healthy carbs, like gluten-free oats and starchy vegetables (pumpkin), raise your insulin a bit, which then can help convert tryptophan into that feel-good neurotransmitter, serotonin. Phew, that makes sense, right? Bottom line, our nutrient, and macronutrient needs adjust as the seasons adjust. Now, just as our bodies are changing and adapting, so is our schedule, our goals, etc. Am I right? Yes, life is like a bowl of cranberry pumpkin vegan overnight oats with cashew cream. It’s filled to the brim with goodness, smells heavenly, and is just waiting for you to embrace it, spoon and bowl! Haha, see what I did there? Yes, life is like that. Apparently, I’m extra corny during this transition into fall as well. As I should be; my husband and I have been through a ton this past year. We’re realizing that as years go by, if we don’t adapt to the growing pains with each other, then years pass without any fruitfulness. Instead, we just feel depleted and weathered. I don’t know about you, but I’m tired of that type of living. Which is why fall is the perfect time to feed the body, mind, soul, and relationships. So let’s welcome the Cranberry Pumpkin Vegan Overnight Oats with open arms. 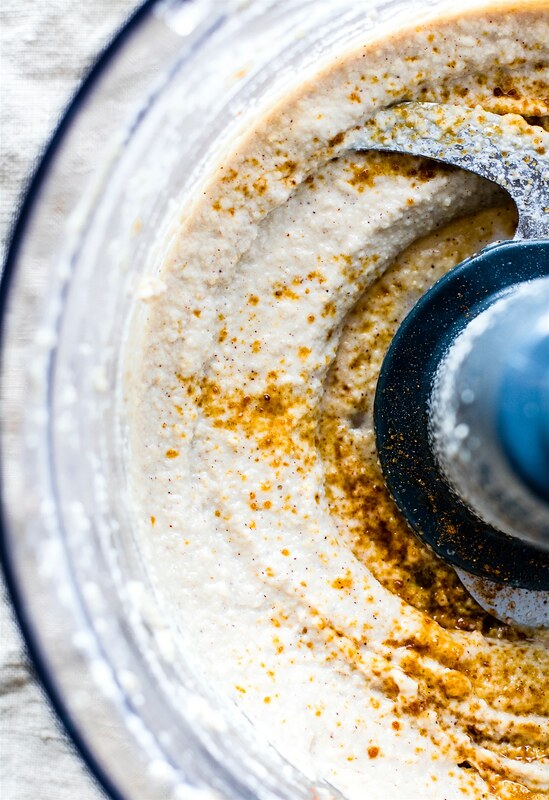 Let’s embrace all things cinnamon spice vegan cashew cream (trendy as it may be, there’s something about it). And let’s slow down and savor the first week of FALL ya’ll! Hey, it’s seasonal food that puts a smile on our face and energy into our body. Ok, enough mushy Monday feel-good talk. I’m ready to share the first PUMPKIN recipe of 2016. Just a few days shy of the official fall equinox. Now you can feel good about face planting this gluten-free bowl of vegan overnight oats goodness afterward. OK.? 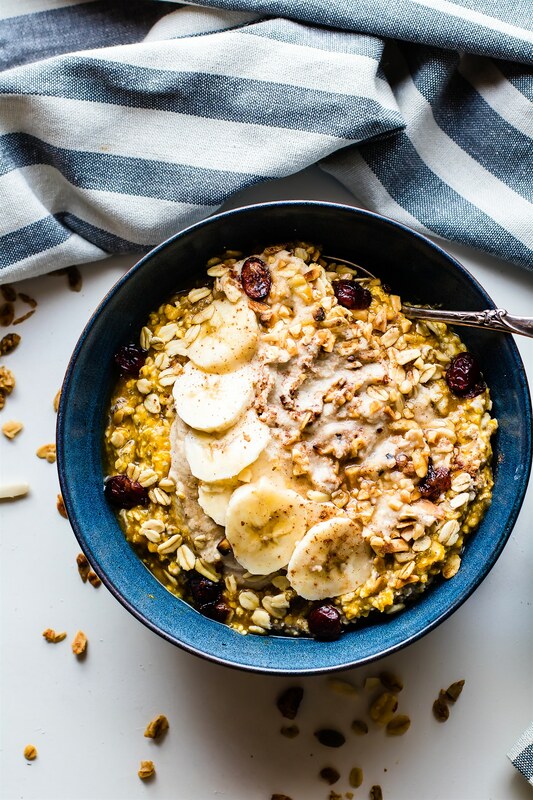 How do you make vegan overnight oats? The key to creating vegan overnight oats is to make them with nut milk instead of yogurt. For sweetness, a touch of maple syrup is added. Pumpkin Overnight Oats with Cinnamon Cashew Cream and cranberry nut topping! 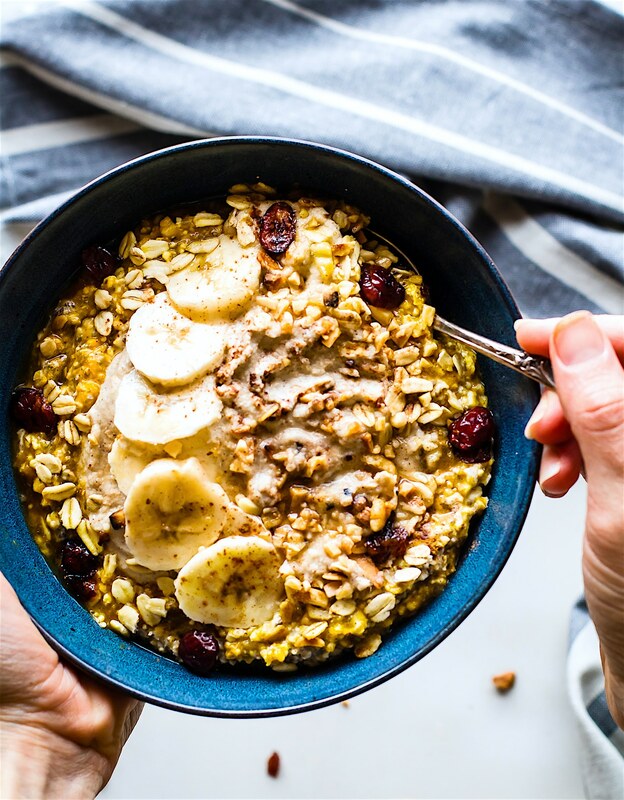 This vegan overnight oats recipe is perfect for a fall breakfast. 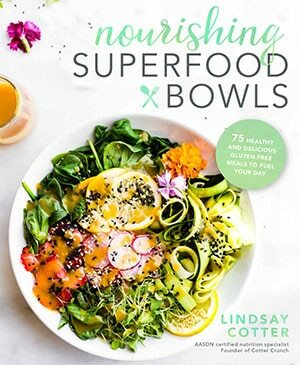 Gluten free, healthy, easy, and oh so nourishing! Combine all your ingredients for the overnight oats. Mix and place in the fridge for 2 – 24hrs, letting it soak. The oats and chia will expand once they start soaking, so you will get more volume after. Be sure to soak your cashews as well. Soak in purified water for 2 – 24hrs. Discard water once soaked. While the oats are sitting, make the cashew cream. To do that, place your soaked cashews in a food processor. Add in the cream and spices. Blend until smooth, then add in the sugar and blend again. It should have a thick, cream-like texture, but a little grainy. Pour into a bowl or container to keep for when ready. Once your oats are ready, remove them from the fridge. Pour oats into bowls. Should make 2 or more servings. Top with banana, toasted or crushed nuts, and 1 tbsp dried cranberries. The fruit should be sweet enough but if not, feel free to add maple syrup on top. If you want it more of a porridge consistency, heat 1/4 cup more milk and pour on top before eating. Nutrition, as shown below, is for 2/3 cup overnight oats with 2-3 tbsp cashew cream. Get ready for more Fall inspired recipes this week ya’ll. I’m feeling inspired, nourished, and ready for a change. And I’ll discuss more on that topic later. 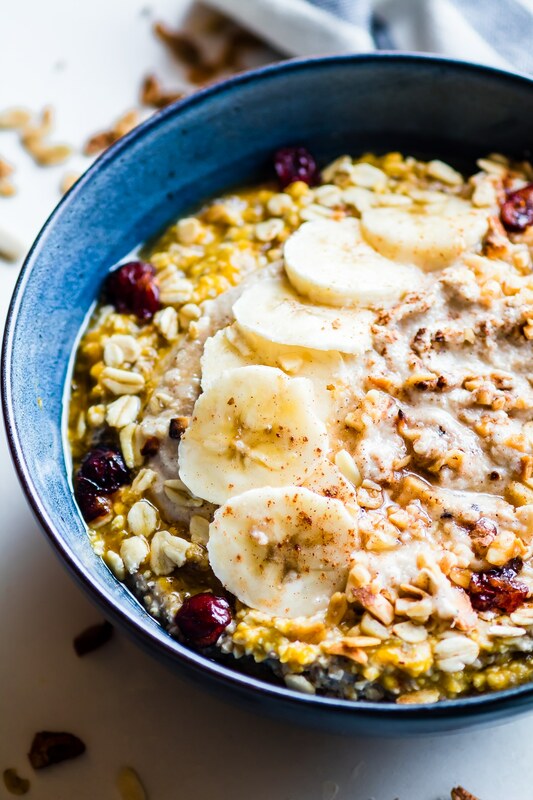 Have you ever made vegan overnight oats? How about a sweet version of cashew cream? The two are made for each other. Like a LOT! Cinnamon cashew cream?! You’re killing me! Also, I love that bowl. i got the bowl from good will! Love it! #died. I don’t even like overnight oats and I want this in and around my mouth. Fall this year feels different. I don’t know how or why, but it does. Also–you sound much better, that makes me happy! 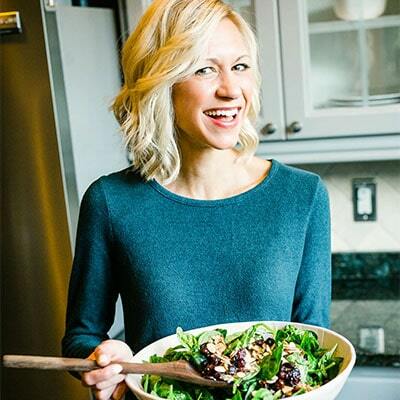 I am looking forward to seeing all your fall inspired recipes this week, I am sure you are chock-full of delicious ideas. What a lovely post! That coconut cashew cream though. That I could drink! the “topping” on the cake…err oats?! It’s so good! i agree. Oats for the win! Well I think these are the most glamed-out overnight oats I’ve ever seen :O Marvelous! haha perfect for a Monday then, right? OMG. Overnight oats with pumpkin and cashew cream. It’s like you MADE this recipe just FOR me. Can I eat it for all the 5 times a day I eat oatmeal??? What a heart warming and positive post. 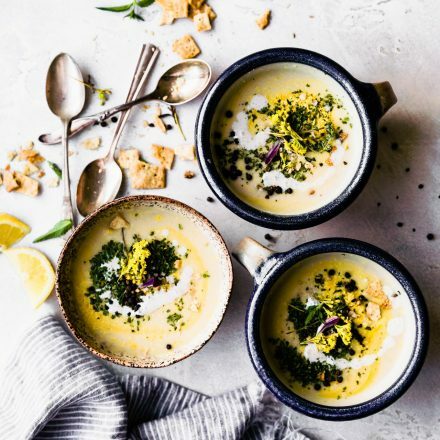 Beautiful and lucious food to match such a deeply motivating and uplifting fall attitude. Great read for a rainy Monday morning in NYC. People always tell me that I am always positive, happy, enthusiastic and upbeat. I spread happiness wherever I go. You are on that path girl and glad to see u so positive you deserve only good? Oh thank you! And keep being positive and upbeat. We need it in our world! <3 it! This looks amazing!!! I love it and it’s perfect for this nursing mama!! yea!! momma needs her energy! <3 it and love you! I love fall and pumpkin and big bowls of oaty goodness. I cannot wait to make this! 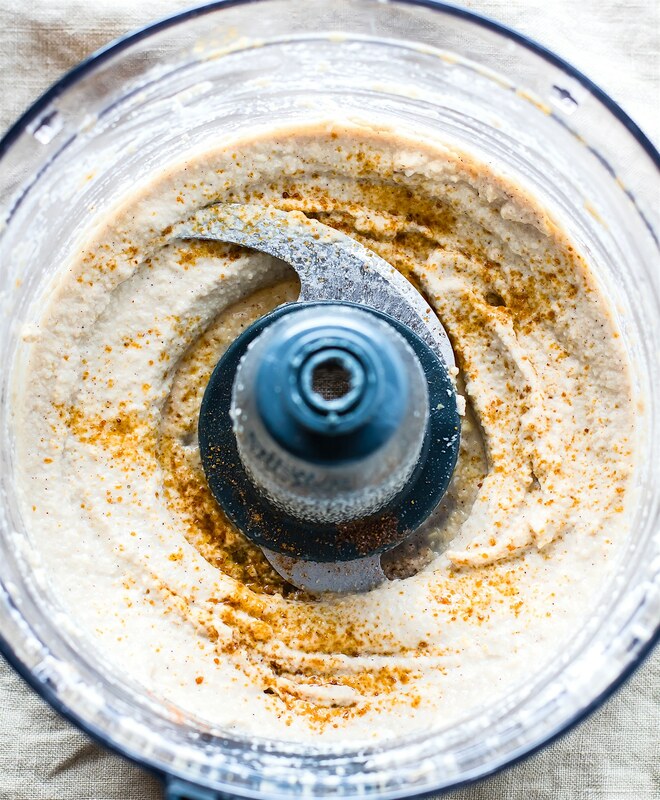 Cinnamon cashew cream sounds like it could be my new best friend, lol! As usual this recipe looks out of this world! OMG you must try it. Maybe on your paleo waffles or bread pudding? I so ready for fall… even if that just mens highs of 69 rather than 73 here. HA! nope. why i love you bro. Roll away. But then that batch is yours. Cool? Thank you friend! I am sure you are ready for those cozy meals too, right? Where are you headed. For you or both of you? I’m heading to MN. COME!!! 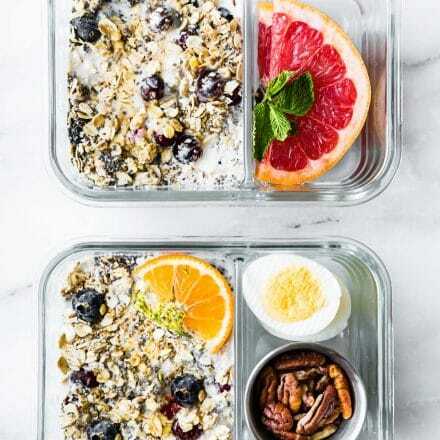 These overnight oats look amazing. Love adding the pumpkin. Ooooh! 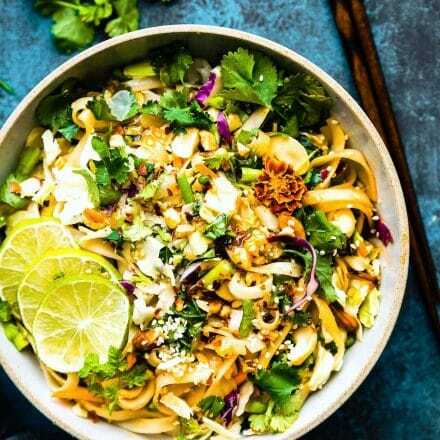 I can’t get enough of cashew cream at the moment so this looks amazing! Ok, so this is really funny, and neat, but reading your post reminded me to slow down again. I just wrote a post about ‘being still in a fast moving world’ and you seriously inspired me to actually practice that again while enjoying all the flavors of fall and embracing the gentle change that comes in every season. I LOVE how you wrote this Lindsay. Thank you for putting so much ‘corny Cotterness’ and love into each word. I think we love Fall for the same reason. It’s a time to slow down, retract a bit inwards, cuddle up with ourselves and recharge. It’s the self love season. That cashew cream sounds freaking incredible. yes! go for it! <3 I welcome slow downs. Nothing but goodness here. What is your best tip for making smooth cashew cream? I’d love to know! i soak them overnight and add in extra coconut milk. Is yours grainy? are you using blender or processor?